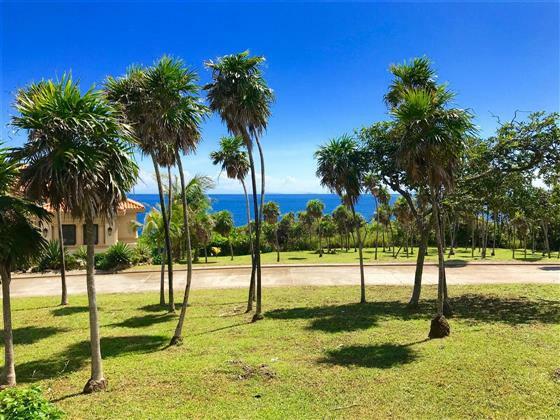 This lot is the best value in Keyhole Bay…Located in the “Seaside Neighborhood” of Keyhole Bay with nice views of the Caribbean and an easy walk to the community pool and beach. The lot is surrounded by luxury homes making this property a sound investment. The lot is approximately ¼ acre in size. Electricity, water, cable TV, and fiber optic internet are run to the lot line. The Keyhole Bay community offers a water system that meets US bottled water standards and Keyhole Bay also has a community back-up generator which turns on during power outages. Keyhole Bay is a gated community with 24-hour security. The Keyhole Bay community pool is absolutely beautiful along with the private Keyhole beach. Lot 18 is located just 1 row back from the sea. On a clear day, you can see the mountains in the mainland of Honduras. Most days, you can see the islands of Cayos Cochinos. You will enjoy watching the cruise ships pass by along with the occasional pod of dolphins. Keyhole Bay is located in West Bay. The walk to the world famous West Bay Beach is less than 10 minutes. You can walk to a number of dive shops, a coffee shop, deli, pharmacy, and gift stores. Many restaurants are also located within walking distance to Keyhole Bay. The community of Keyhole Bay is a mix of full-time residents, seasonal residents, and short-term renters. The neighborhood is very social and welcoming to new residents. Want To Know The Value Of Your Property? Property In A Given Area As well As We Do. We’ll Help You Find The Best Possible Alternative And Work with You To Achieve Your Goal. Of course, there is NO obligation attached until you agree to list your property with us..
An added advantage that we have is that quite often we can find our clients properties that can’t be found on the Roatan MLS service. This happens because we were born here, we grew up here and we know lots of people. We know who owns properties that may not be on the market YET, we know how to reach those people to determine if they might be interested in a making potential deal. YES, of course we work with the MLS Listings, BUT we sell more of these NON-MLS LISTINGS year after year then we do traditional MLS listings. In fact, every property listed on our website is NOT listed in the Roatan MLS service and you will only find those listings here. Working with us means you’ll have access to the most properties (both MLS and Non-MLS) and unmatched insight as to what’s likely to change on the island in the next 2 years, 5 years, etc. We work hard to ensure you completely understand the process (buying or selling) and we offer our opinions, recommendations, and suggestions on how to maximize your benefit in working with us. Sometimes this means that we talk a buyer of of considering a property because they’re not seeing the complete picture. Sometimes this means we don’t provide a falsely high valuation number that a seller wants to hear. You’ll know exactly what to expect from us in advance. We’ll continue to sleep well at night knowing we’re doing the very best we can do for our clients. Our impeccable reputation that originated back in 1991 is not in danger over making a quick buck! No One Else Knows Our Island Like We Do. We’ll Give You The Insider’s Tour. Too many people focus on the number of showings to rate the effectiveness of a Realtor. Having lots of showings typically indicates a poor qualification process for that Realtor. Instead, we ensure that every potential is well-screened / qualified prior to wasting your time or ours.